A few Saturdays ago my friend, Willow, Princess Polliwog and I attended an event at our library. It was called Cupcake Wars. Each person had to simple decorate a cupcake any way they liked and then three people who worked at the library judged all the cupcakes. It was really fun! 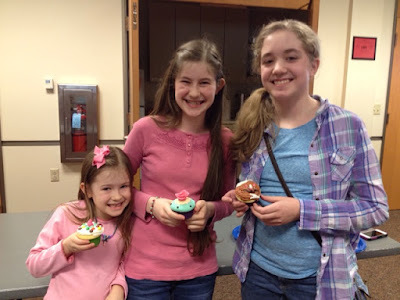 Here is a picture of us all with our cupcakes. Princess Polliwog's cupcake. It's a beautiful snowflake! Willow's cupcake. Isn't that little kitty cute? Here is a picture of my cupcake that I took after the contest. I made it entirely out of fondant. A picture of three of our cupcakes. Here are all the cupcakes waiting to be judged.